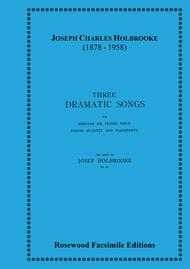 Three Dramatic Songs composed by Josef Holbrooke. Strings, Voice and Piano. For 2 violins, viola, cello, piano, soprano voice/tenor voice. This edition: Facsimile Editions. Sextets. 20th Century. Score and parts. Published by Rosewood Publications (RW.RFE-62).Joseph Charles Holbrooke (1878-1958) was an English composer, conductor, and pianist. He was sometimes referred to as "the cockney Wagner." Holbrooke studied piano at the Royal Academy of Music in London, where he won the Lucas Prize and the Sterndale Bennett Scholarship. His reputation before World War I was that of a quite promising and controversial young composer. Elgar expressed approval of his works. Commissions played a large role in his early career. He was paid to write several large works for the choral festivals which flourished in England at that time. Holbrooke's setting of Edgar Allan Poe's The Bells for example, was premiered in 1906 on the same day, at the Birmingham Triennial Festival, as Elgar's The Kingdom. His symphonic poem based on Poe's The Raven was played at the Crystal Palace in London. Holbrooke's compositions were performed throughout Europe in the first quarter of the 20th Century, but his reputation has fallen appreciably over time. Many of his publishers have gone out of business and few of his published works remain in print. Thus his work is basically inaccessible today.